SAN DIEGO (KGTV) -- Rep. Duncan Hunter looks to advance to the November runoff, but it's unclear who he will face in the race for the 50th Congressional District. 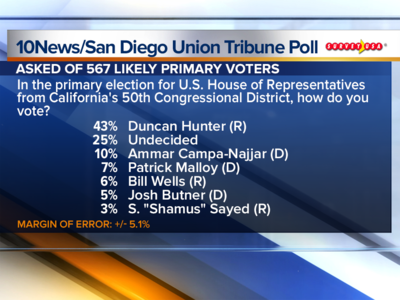 The latest 10News/San Diego Union-Tribune poll shows Hunter leading the race by 33 percent. Ammar Campa-Najjar was next with 10 percent followed by Patrick Maloy with seven percent. When voters in the district were asked about the job Hunter is doing, 50 percent say they approve. Forty percent of voters polled in the district also say the fact that Hunter is under investigation by the FBI for alleged misuse of campaign funds has no impact on their vote. The two candidates with the most votes in the primary will advance to the November runoff.